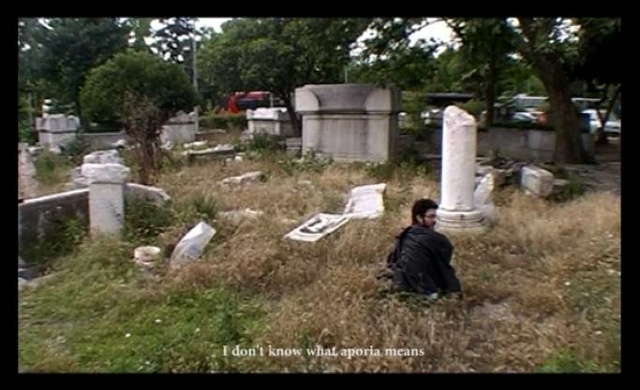 Next to a street with cars passing, in a garden with ruins of ancient Greece, the artist is sitting, his back to the camera. His shoulder and hand move up and down in masturbation. The video is silent except when - from time to time - he stops this monotonous act and turns back saying: I don't know what aporia means. Barbad Golshiri was born in 1982 in Tehran. He has worked both as an artist and a socio-political critic of art. His medium varies from video, installation, photography, documented performance to bande dessinnée and visual poetry. He is also translator and editor of Samuel Beckett's dramatic works in Persian. Most of his works are language-based and contend with art and literature's plane of feasible; the impossibility of quitting the possible field of expression; the aporia of expressing not to express. Golshiri has also been portrayed as a provocative critic of the current socio-political situation in Iran, hegemony of the new art market of the region and the living doxas.